The Canopy Tower Lodge's top deck, a splendid spot for birders and birds. The big yellow ball? This was once a Canal Zone radar station back in the day. Now it's a really neat place to watch (and sketch) birds and a really nice place to stay, too. I talk a lot about Barro Colorado Island, having been a frequent visitor over the past 15 years. But there’s a lot to explore in the canal zone. The architectural beauty of Gamboa and the biodiversity of nearby Pipeline Road, for instance. Antbirds are a favorite group of mine and on the mainland they are more diverse and abundant. An army ant swarm on BCI is exciting, but on Pipeline Road, it’s a serious birder’s fiesta. 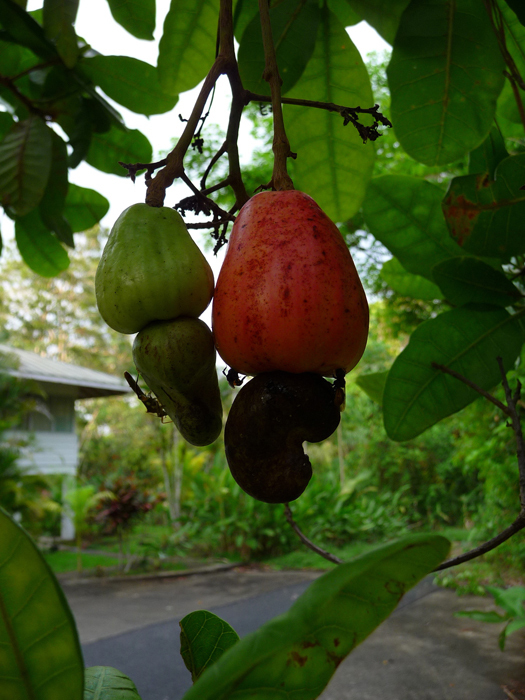 Cashew nuts in a Gamboa garden. Gamboa was originally built for the employees of the Canal in the early part of the last century. The houses are wooden and old-fashioned, tin-roofed and designed to stay cool in the tropical climate. Most are raised up on stilts for air-circulation beneath the floor-boards. They are high-ceilinged and tall-windowed and cooled by prevailing breezes and slowly spinning fans. Palms, avocado and mango trees shade Gamboa’s streets where parakeets swirl and fill the air with cries at dusk. Trogons and motmots hunt at the edge of the grassy playground in the middle of town as though it were a big treefall gap in the middle of the jungle. The jungle starts where the pavement ends. 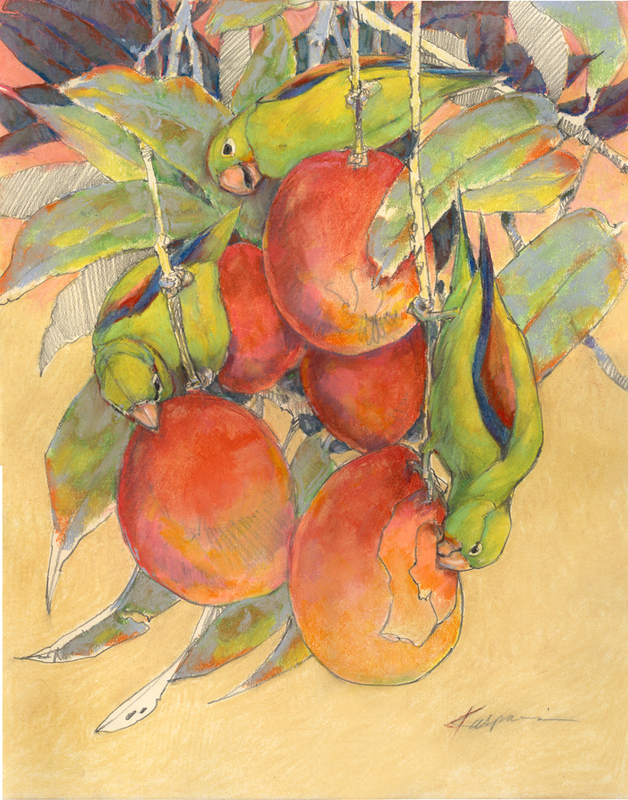 "Canal Zone- Orange-chinned parakeets on mangos" Graphite and pastel on paper, 16" x 20". From field sketches made on a balcony in Gamboa. During my last week on BCI last May I treated myself to a night’s stay at the famous Canopy Tower Lodge in Gamboa. It’s a charming experience for the nature traveler. 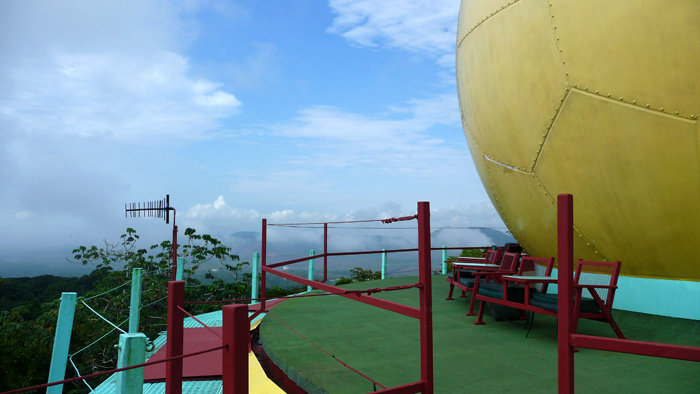 A converted radar station perched at the top of a hill near the Chagres River, its rooms are arranged in rings lining the outer walls of the metal structure. My own room was small, tidy and tight like a ship’s cabin and I had the odd sensation 0f being aboard an ocean liner in a rolling green sea. My window opened to branches and sky. I fell asleep watching nightjars crisscross the airspace. 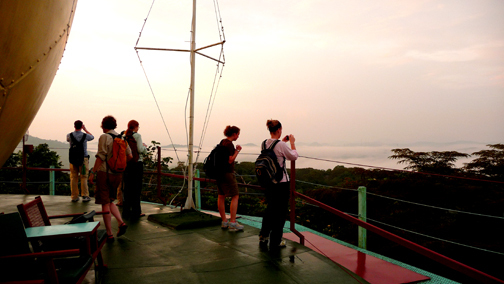 Early morning birding on the Canopy Tower Lodge's top deck, with strong coffee in china cups. A time and place to see the highest amount of activity, and the birds were good, too. The uppermost floor was a reading room/dining hall; a big open space with couches and hammocks and small tables and chairs at every window for viewing toucans, honeycreepers and tamarins (tiny totally adorable monkeys). Flowering vines attracted purple-crowned fairy hummingbirds. Wine was served. Dinner was divine. 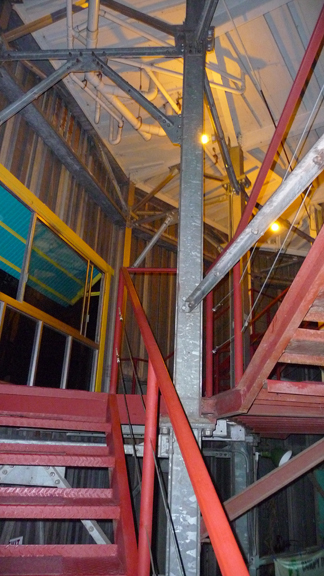 The top deck, a roof platform, was reached by climbing up through a hatch from the dining hall. From here I could look directly into the treetops and watch the sun burn off the morning fog in ghostly streamers. Toucans croaked from the tips of snags, tamarins nursed their babies. Scopes were set up so far-away birds-scaled pigeons and blue cotingas- could be brought into closer view. Coffee was served. Guides at the Canopy Tower Lodge. Carlos could find (and point out) anything, and seemed to knew every bird in the forest like an old friend. 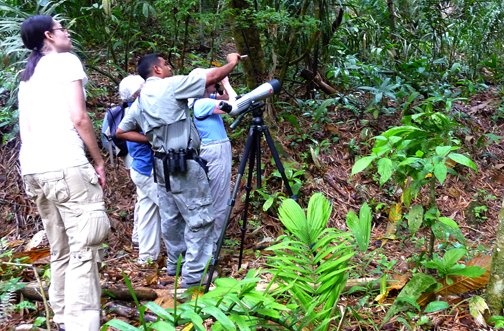 The best thing about the Canopy Tower were their birding guides, all local naturalists. I tagged along on a few field trips, including one to the Summit Ponds, where we got three species of kingfishers and great looks at boatbilled herons and gray-necked woodrails. Guides Carlos Bethancourt and José Soto let me sketch through their scopes to my heart’s content. They even found me my lifer great potoo, and let me draw that, too. The pace was surprisingly relaxed, unusual since birders are often in a hurry to move on and see the next species. But this group was a hiking club from Portland, Oregon, and they were interested in everything from ants on the ground to trees in the forest. The vibe was mellow. No one gnashed their teeth, tapped their foot or even looked at their watch. I got to bliss out drawing birds and couldn’t believe my luck. 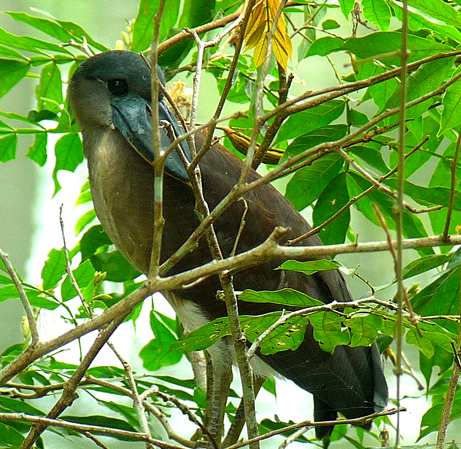 Boat billed heron at the Summit Ponds, Gamboa. Carlos not only let me sketch through his scope but kindly taught me some digiscoping techniques. Next: Birding the Pipeline Road. 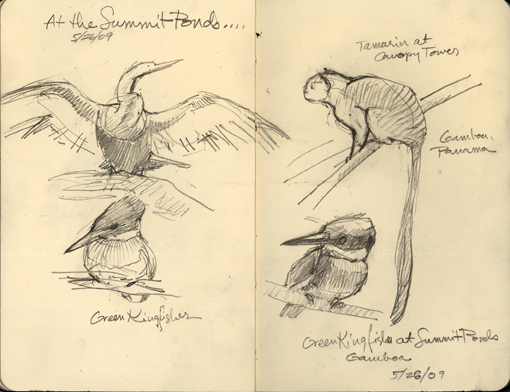 Sketched at the Summit Ponds, Gamboa, and at the Canopy Tower Lodge. 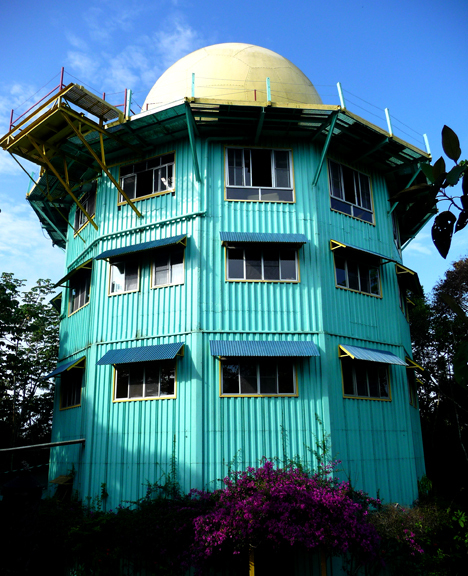 The Canopy Tower Lodge, an old canal zone radar station converted into a delightful birder's haven. Great color scheme, isn't it? Canopy Tower Lodge, interior view. Wow! Beautiful writing and fantastic photography. This makes me ready to go back now! Looks like a grand adventure and as always crazy about your bird drawings.